While there is much turmoil in the Kashmir valley, much more is being written on the sufferings and emotions of the people in that part of India. 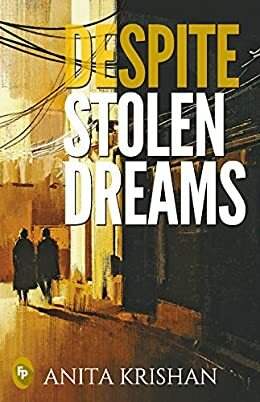 Many authors have picked up the subject and today we are talking about one such incredible fiction that connects Kashmir and Delhi through an emotional journey – Despite Stolen Dreams by Anita Krishan. Without further ado, let’s get straight to what Anita Krishan’s new book, Despite Stolen Dreams, has to offer to the readers. Despite Stolen Dreams is written by Anita Krishan and it is her third book. The story is an impeccable journey of tragedy, loss, fear, courage, friendship and most importantly humanity. Anita Krishan is brilliant with the narrative and successful in the hooking the reader to the pages. In the midnight, Wali Khan and his family escape a house-arrest from a bunch of terrorists, one of them being their own servant, Shakeel. Leaving all behind in their homeland, the family comes to the heart of the country, Delhi. The only plan is to get lost in the buzzing swarm of the people in the city. During the next few years, the family reluctantly adjusts to everything new. With new experiences and friends especially Kashmira Singh, Wali and all the family members were eventually trying to survive in their new lives, While, somewhere near the border, Shakeel goes through a life-changing event as he survives a head-on fire attack with the Indian army. As the plot of Despite Stolen Dreams by Anita Krishan reaches the climax, everything converges back the way it started; another house arrest. But this time, the captivity sets all of them free for the rest of their lives. Why should you read Despite Stolen Dreams by Anita Krishan? With this 300-page novel, Anita Krishan brings out a great narrative, riveting story and thought-provoking tale. Character development is strong and you will wait for things to happen. At times it will surprise you, sometimes it will cherish you but won’t disappoint you. The way everything converges towards the end will teach you to value freedom and human emotions. Go ahead and get your copy of Despite Stolen Dreams by Anita Krishan on Amazon now! An emotionally rich read and definitely a great escape from popular fiction! Anita Krishan was born in Shimla in 1955 and brought up listening to tales from her parents. As a child, She was very fond of reading. Anita completed her Masters in English Literature from Himachal University. She has been a teacher and currently works as a senior columnist at The Indian Economist. Anita has written several poems and novels too. Her first book ‘Tears of Jhelum’ was published in 2014. She has written two more books since then – Fluffy and Me (2015) & Despite Stolen Dreams (2017).